Ofir was taken during in 1939 to the U.S.S.R. 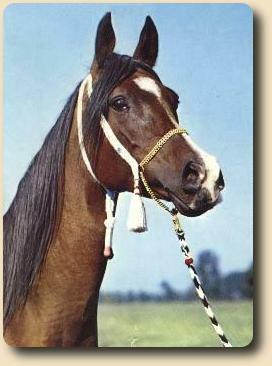 He was one of the greatest sires in Polish and world breeding. Ofir was used at Janów Podlaski Stud in the years 1937 - 1939, since 1939 used at Tersk Stud, where he was taken along with most of his progeny. Ofir left four stallions in Poland who became world famous sires and chief progenitors of the Kuhailan Haifi or.Ar. line. These stallions were: Witraz (1938), Wielki Szlem (1938) - both saved during World War II and used in Poland, Witez II (1938) - taken to the U.S.A., and Wyrwidab (1938) - known as Wind and left in Germany. In Poland Ofir only sired four daughters including Wilga (1938) and Ofirka (1939) - miraculously saved in 1939 and both founded important families in Poland after World War II. Ofirka was the dam of Orla (1962) - winner of Derby, Oaks and twice Criterium, exported to the U.S.A and of Orzel (1963) - US and Canadian Top Ten Stallion and Race Champion.